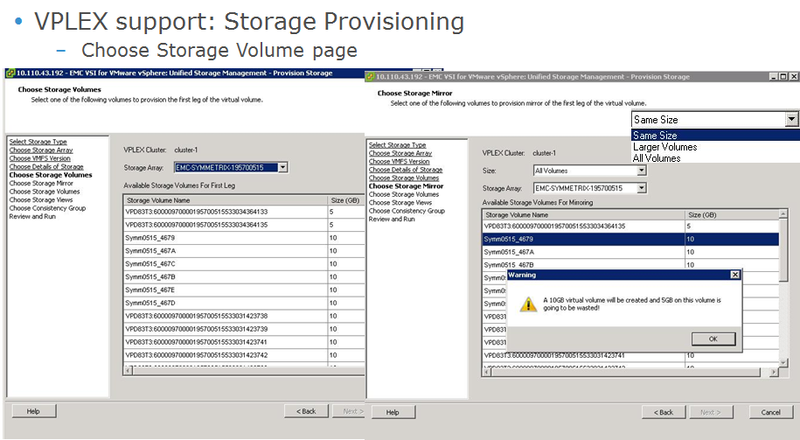 Virtual Storage Integrator 5.6 Is GA!, Grab It While It’s Hot. part of the fun of being integrated to the large machine is also leveraging the mass R&D investment EMC is making in it’s global frameworks, not just the specific product itself. such as an example is EMC VSI, which is now at it’s 5.6 iteration, this release brings many new features but in the context of XtremIO, well, it now support XtremIO! Abstract: The EMC® VSI for VMware vSphere: Unified Storage Management feature can provision Network File System (NFS) datastores on NAS storage and Virtual Machine File System (VMFS) datastores and Raw Device Mapping (RDM) volumes on block storage, and perform array-based compression and array-based cloning of virtual machines in NFS and VMFS datastores. The cloning functions, with Citrix XenDesktop and VMware Horizon View integrated, include Full Clones (copies), Fast Clones (snaps) and Native Clone (same as VMware native clone function)of Virtual Machine Disk (VMDK) files. 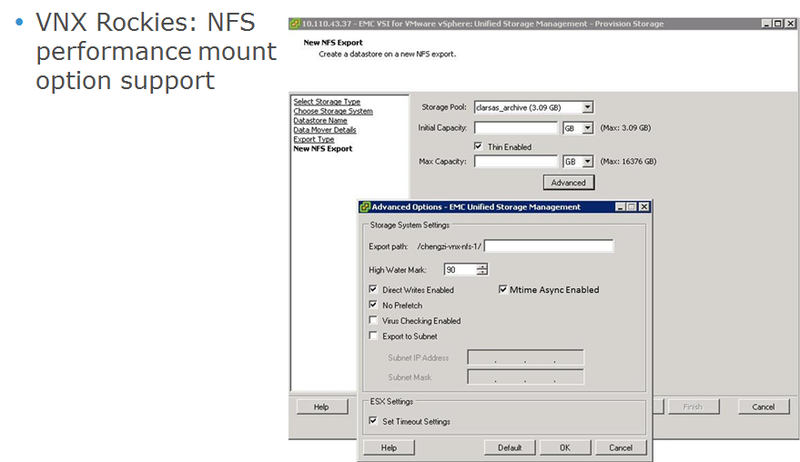 VMware administrators can use the feature to manage NAS and block storage. Version 5.6 adds support for Native Cloning (VMFS datastores only), XtremIO provisioning over FC, VPLEX provisioning and properties view, Striped metavolumes for large VMAX systems, NFS performance mount option on Next-Generation VNX, Block deduplication on Next-Generation VNX systems, Access Control Utility for XtremIO and VPLEX credential management, refer to the latest Version 5.6 Release Notes for more information. Abstract: The Storage Viewer feature extends the vSphere Client to facilitate the discovery and identification of EMC Symmetrix, CLARiiON, Celerra, VPLEX, XtremIO, VNX and VNXe storage devices that are allocated to VMware ESX/ESXi hosts and virtual machines. 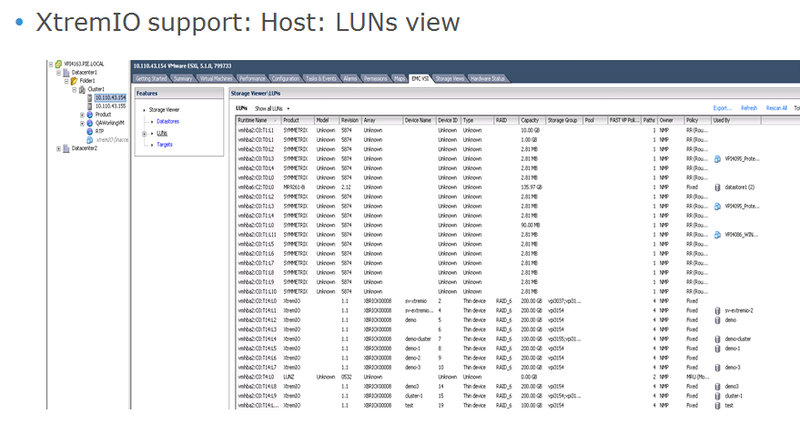 Storage Viewer presents the underlying storage details to the virtual datacenter administrator, merging the data of several different storage mapping tools into a few seamless vSphere Client views. 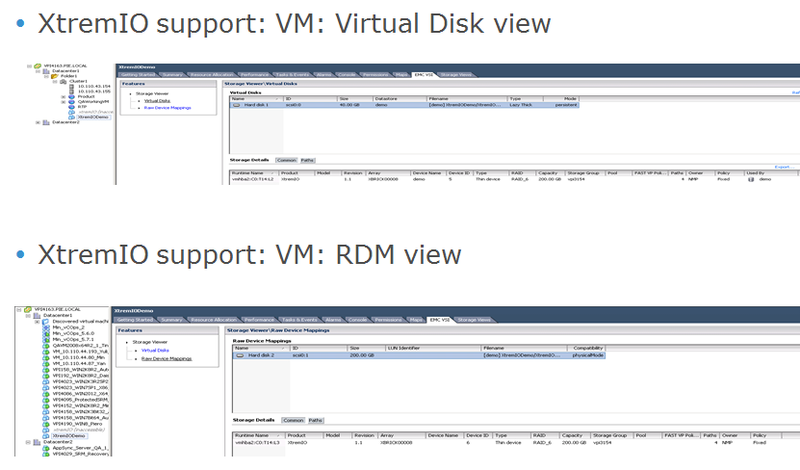 VMware administrator can view the performance monitoring for storage array within vSphere client. Version 5.6 adds support for EMC Solutions Enabler 7.6.1, Next-Generation VNX storage arrays, XtremIO 2.2 and VMware vSphere 5.5, refer to the latest Version 5.6 Release Notes for more information. 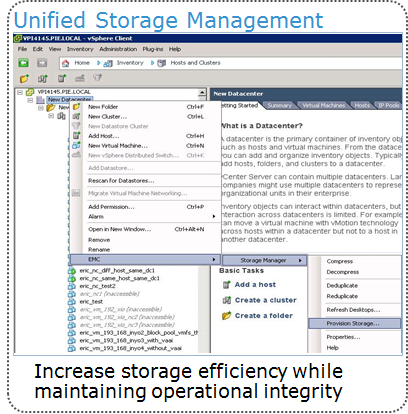 Abstract: EMC Virtual Storage Integrator (VSI) for VMware vSphere: Path Management. 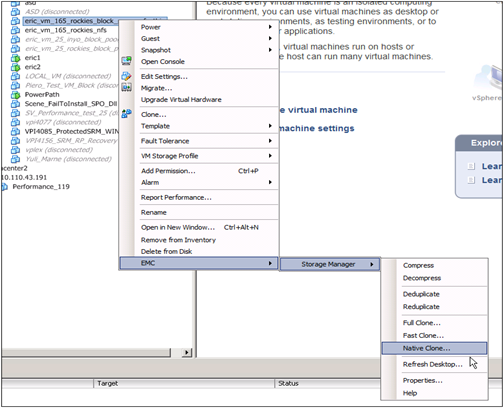 The Path Management feature for EMC Virtual Storage Integrator (VSI) for VMware vSphere includes support for both VMware Native Multipathing Plug-in (NMP) and PowerPath/VE. 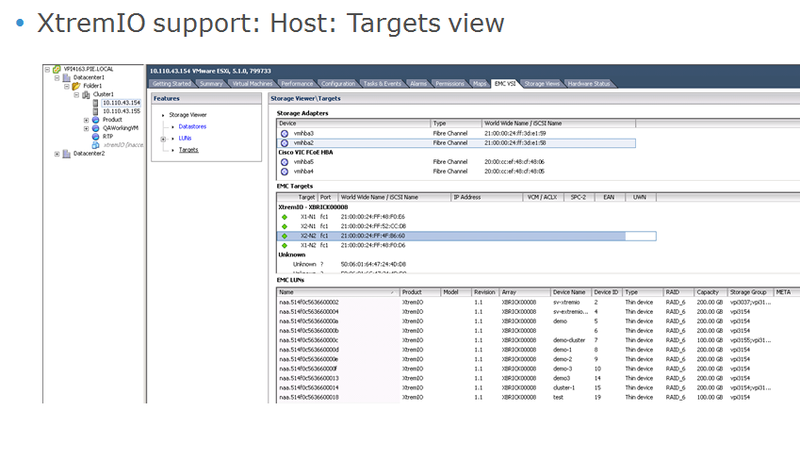 This feature allows you to change the multipath policy for Symmetrix, CLARiiON, VPLEX and VNX systems and is a first step in allowing the VSI user to manage multiple paths from within the vSphere Client. Version 5.6 adds support for VMware vSphere 5.5, Power Path/VE 5.9, Next-Generation VNX storage arrays, refer to the latest Version 5.6 Release Notes for more information. 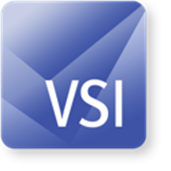 Abstract: EMC® VSI for VMware vSphere™: AppSync Management is a feature of EMC Virtual Storage Integrator (VSI) for VMware vSphere. It is designed to create service plans for the EMC VNX® and RecoverPoint platforms. 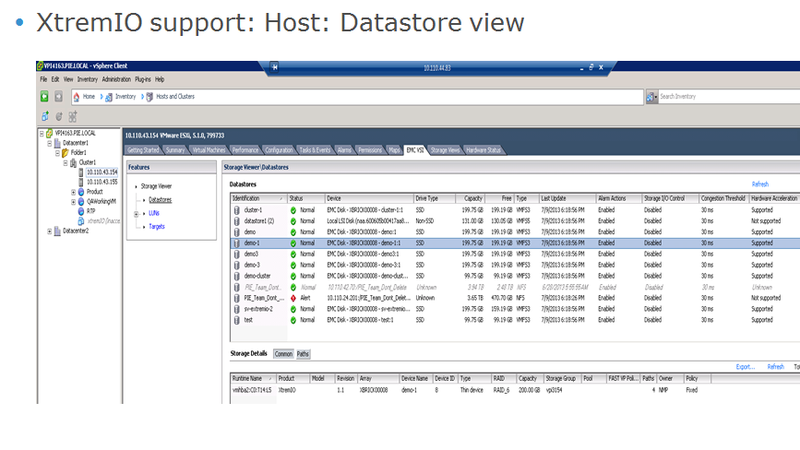 The feature enables VMware administrators to configure service plan, datastore copy mount/unmount/restore/expire for EMC AppSync server directly from the vSphere Client. Version 5.6 adds support for half-hour RPO schedule option, VMware vSphere 5.5, Next-Generation VNX and RecoverPoint 4.0 SP1, refer to the latest Version 5.6 Release Notes for more information. 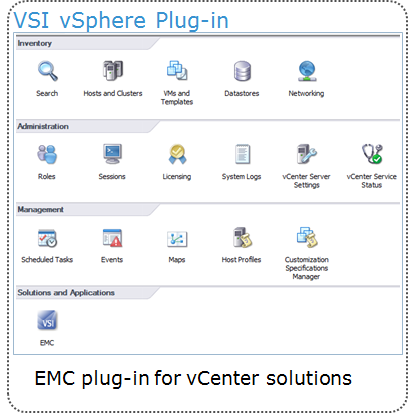 Abstract: EMC® VSI for VMware vSphere™: RecoverPoint Management is a feature of EMC Virtual Storage Integrator (VSI) for VMware vSphere. 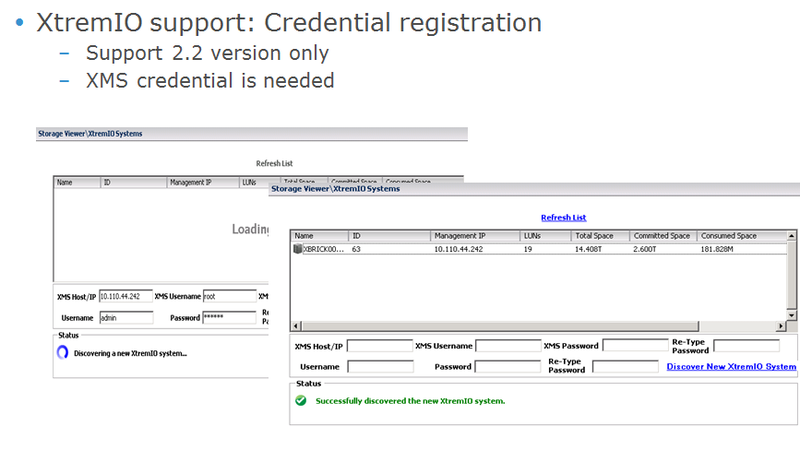 The RecoverPoint Management feature is designed to assist you in designating specific backups to use for data protection and your disaster recovery needs, provides the details for you to easily select the specific Point in Time (PiT) copy for your data protection and disaster recovery plans when using VMware vCenter Site Recovery Manager. Version 5.6 adds support for RecoverPoint 4.0 SP1. Abstract: Symmetrix SRA utilities 5.6 is an EMC developed plug-in to the VMware vCenter management software. This guide is part of the EMC Virtual Storage Integrator for vSphere Client documentation set and is intended for use by VMware administrators and storage administrators during installation, system setup, and routine operations. It will ease the management of the virtualized environment. This plug-in supports EMC VMAX 10K, VMAX 20K, 40K. It is available for customers at no charge. Version 5.6 adds support for SRA 5.5, SRM 5.5 and vSphere 5.5, and add new functions of device mask/unmask, three Site Cascaded/Concurrent Non Star, and three new global options, refer to the latest Version 5.6 Release Notes for more information. Next Post Next post: PowerPath/VE 5.9 Is GA!